Local English-speaking guide to accompany group throughout. Overnight at Summit River Lodge, Brigands Bend, with all meals, on twin share basis. 3 nights at Dwarikas Hotel in Kathmandu on twin share basis. Meals as indicated in itinerary – included lunches may be in your hotel, in local restaurants or picnic lunches. Porterage of bags to Summit River Lodge. Services of porter/s to carry painting materials. An inspiring tour of some of the most beautiful towns, villages and ancient cities of Nepal, with stunning mountain scenery and expert tuition from a highly accomplished artist. Nepal can be a real inspiration for artists with its spectacular mountain views, wonderful scenery and beautiful countryside, magnificent palaces and temples, pretty villages, ancient farmhouses and in addition delightful children and wonderfully friendly people. We are delighted to offer this painting tour with Susanna Bailey. Not only is Susanna an accomplished artist and inspired teacher, but she also knows the Himalayas well so she is the ideal person to accompany you on this painting tour to Nepal. On this trip you will begin in the Kathmandu valley where you will visit the medieval city squares of the three principal towns of the valley, Kathmandu, Patan and Bhaktapur. You will also have the opportunity to paint Tibetan Buddhist pilgrims as they visit the centuries-old stupas at Swayanbunath and Boudhanath. From Kathmandu you will move on to Pokhara, Nepal’s second city, located on the shoes of a beautiful lake and enjoying the most fabulous mountain views. You will also visit Chandrakot for a view of traditional village life and Bandipur, a small town of great charm. As a change from sightseeing and painting you will also have the opportunity for some gentle river rafting and an overnight at a lodge close by the banks of the Trisuli River. An added attraction on this fantastic trip with be a stay at wonderful Dwarikas Hotel in Kathmandu with its palace-like atmosphere and secluded courtyard garden. As well as seeing all the sights you will have plenty of time to paint some of the scenes you see and Susanna will always be on hand to offer advice, encouragement and one-on-one tuition, making this tour suitable for any level of artist. Meal arrangements: 11 breakfasts, 7 lunches and 8 dinners included. Sightseeing in Kathmandu Durbar Square and Swayanbunath stupa and painting in Patan. Full day in Bhaktapur and painting. Fly to Pokhara. Lake painting ‘demo’ by Susanna. Boat trip on Phewa Tal Lake. Painting beside the lake. Drive to Lumle and walk to Chandrakot. Painting in Chandrakot. Drive to Bandipur and explore village and painting. Drive to raft put-in and raft to lodge. Drive to Kathmandu and free time. Walking tour to Boudnath Stupa and painting at stupa. Free time and review, with exhibition of paintings at Dwarikas Hotel. Celebration dinner. Susanna Bailey first travelled as an artist when she won the Nancy Balfour Scholarship during her postgraduate years at the Slade School. Her love of drawing and painting has taken her all over the world as a tutor and as a working artist and she has exhibited nationally and internationally since leaving art school. She is perhaps best known for her landscapes in watercolour. Susanna has travelled and painted in Nepal and set up a small charity there. A set of her portraits were sold to raise funds for the 2015 Nepal Earthquake appeal. 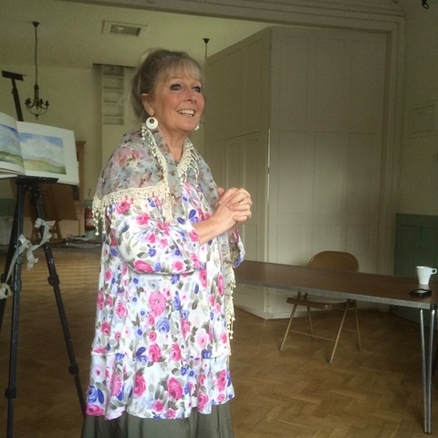 Susanna enjoys sharing her love of art and will be patient and encouraging in helping you develop, whatever your experience, and will help you get the most out of your holiday, both with demonstrations to the group and with one-to-one tuition. Susanna will be assisted by a local English speaking tour guide who will look after all local arrangements and ensure that your trip runs smoothly. On arrival in Kathmandu you will be transferred to the Shangri-La Hotel. This is a very comfortable hotel situated to the north of Thamel, the tourist district of Kathmandu. The hotel has a lovely garden with a swimming pool and an excellent restaurant. The bustle of Thamel with all its restaurants, shops and bars is a 20 minute walk or 10 minute taxi ride away. Day 3 - Walk from Kathmandu Durbar Square to Swayanbunath. Drive to Patan. Afternoon painting in Patan Durbar Square. Kathmandu is a wonderful mixture of the ancient alongside the modern - crowded bazaars still throng with colourful local people as they have done for hundreds of years, while roads are crowded with cars, roaring motorbikes and buses belching out black smoke; ancient temples and crumbling shrines sit alongside modern offices, picturesque palaces slowly sag into dereliction while Buddhist stupas gaze over the bustling scene with their all-seeing eyes. Meanwhile, in the tourist hub of Thamel you will find restaurants and bars, shops and internet cafés. Although this is a crowded, noisy and polluted city, it is also fascinating, friendly and vibrant. Firstly today you will drive down to Kathmandu's Durbar Square where you will see some fine monuments, including the Hanuman Dhoka (the old Royal Palace), the temple housing the Kumari or 'Living Goddess' and many other wonderful masterpieces of Newari architecture and wood carving. You will then walk through to Swayanbunath, also known as 'The Monkey Temple'. This fascinating temple is perched on a hilltop to the west of the city and is a site of pilgrimage for both Hindus and Buddhists. For those who are not keen to climb the long way up the famous steps to the temple, transport will be on hand to take you close to the back entrance. Later you will drive to Patan, Kathmandu's twin city, located just a few miles to the south. Patan is a very ancient city, believed to have been founded in the 3rd century AD. The Newari people of Patan are famed as fine artists and craftsmen - Patan's Durbar Square is a testament to their workmanship and is arguably the finest square of the Kathmandu valley. The woodcarving, metal artwork and stone work of the magnificent temples and royal palaces show evidence of this rich artistic heritage and in the streets of Patan you find people still working in traditional crafts such bronze, wood and stone. A visit to the excellent museum in Patan will introduce you to many fine works by Newari artists and craftsmen, who are particularly celebrated for their tradition of producing very fine bronze statuary, using the lost wax method. You will have the afternoon to paint in Durbar Square. You will look at colour and portraying buildings and people. Susanna will demonstrate all these aspects in one quick watercolour using only three colours. Susanna will also provide an opportunity today for you to purchase local papers and pigments if you would like to use them during the tour. Day 4 - Full day in Bhaktapur. Today you will have a full day in Bhaktapur, about an hour's drive away and one of the three cities built in the Kathmandu valley by the ancient Malla kings. Bhaktapur is rather more laid back than Kathmandu city and still has quite a rural feel to it, and is a town of farmers and craftsmen. The people of Bhaktapur are famous for their skill in painting thankhas, paintings on cotton or silk usually depicting a Buddhist deity, scene, or mandala. Bhaktapur's Durbar Square area has some wonderful examples of Newari craftsmanship in its temples and palaces. Many of Bhaktapur's buildings having their origins in the 15th Century and the side streets have a really medieval feel to them with streets being mostly brick paved. It is still very much a lived in city, and with much of it being closed to traffic walking around is a pleasure and you will get a real taste of how things must have been in medieval times. You will have time to walk around for an hour of two before choosing somewhere to paint and you will then have the rest of the day there before driving back to Kathmandu in the late afternoon. Today Susanna will concentrate on travellers' details - a day for four small images. You will prepare the backgrounds before you set off. Day 5 - Fly to Pokhara. Time to relax. Susanna does a demonstration of lake painting. Today you will transfer to the airport for the short domestic flight to Pokhara, Nepal's second city. Pokhara has a wonderful location being set on the banks of Lake Phewa Tal and enjoying magnificent views of the Annapurna range of mountains. Your hotel, the Fishtail Lodge is the oldest established hotel in Pokhara and is situated on an arm of Phewa Tal Lake in an unrivalled secluded position with wonderful mountain views and yet still just a short walk from the hurly-burly of Pokhara's lakeside. You will have lunch at a local restaurant and in the afternoon there will be time to relax in the hotel's lovely gardens. Later Susanna will give a demonstration of lake painting and will introduce reflections on water, and warm and cool colours. Day 6 - Morning Excursion on Lake Phewa Tal. Afternoon painting beside the lake. On a clear day, there are astounding views of the Annapurna range of mountains from Pokhara, including most famously the holy Machapuchare or 'Fishtail' Mountain. It is well worth getting up early to see sunrise on the mountains, as the moment when the first flush of pink colours the peaks the view is truly stunning; you might ask the hotel reception to arrange an early morning call for you, so that you do not miss it. In the morning you will take a boat ride on the lake, perhaps paying a visit to the two-storied pagoda style temple of Tal Barahi located on a small island in the centre of the lake. On this excursion you will enjoy wonderful views of the not so distant mountains and of the terraced hillsides around the lake and you can also watch the daily life of local people along the shores of the lake, with boats loaded with produce crossing the lake, water buffalo up to their noses in the water and children splashing about in the shallows. You will have the afternoon for painting by the lakeside. Water, water everywhere and a whole day to paint boats and lakeside nature. Later you will review work so far and plan for the next days. Day 7 - Free day in Pokhara. Today you will have a day in which to roam and enjoy time to yourselves. There is plenty to see in Pokhara. The hotel gardens would be a pleasant spot to do some painting or you might wander along to the lakeside area for some people watching or shopping, or visit the Mountaineering Museum which has interesting displays on expeditions in the Annapurna Range and on the mountain peoples living in the region. It would also be pleasant to take a walk up to the ridge behind the hotel to the so called 'Peace Pagoda' for amazing views over the lake and mountains. Alternatively you could take a taxi to the Devis Falls Tibetan Centre to look at the carpet weaving there or visit the little school to meet the charming Tibetan children. On the opposite side of the road to the Tibetan Centre are the Devis Falls, an interesting rock formation and waterfall - take a look at the precipitous gorge and strange rock formations - there may not be any water flowing over the falls at all times of the year but this still makes an interesting visit. Day 8 - Drive to Lumle and walk to Chandrakot, 1,565m/5,134ft. Painting in Chandrakot. Return to Pokhara. After breakfast you will drive for about one hour across the paddy fields of the valley of the Seti Khola river and then zig zag up to a ridge to reach the little village of Lumle. From Lumle it is a pleasant walk, taking about an hour, to reach Chandrakot, a village of the Gurung ethnic group famous for their exploits as soldiers in the Gurkhas. Chandrakot is attractive village set in a stunning location on a ridge enjoying fabulous all round views, looking down into the beautiful valley of the Modi Khola river and north towards the spectacular peaks of the Annapurna range of mountains. You will have the day to paint in Chandrakot with lunch in a local lodge in the village and in the late afternoon you will return to your hotel in Pokhara. Today Susanna will concentrate on texture and colour and will introduce the group to the use of wax, stains, doilies, salt and cling film. Day 9 - Drive to Bandipur. Morning painting in village. Afternoon drive to ‘put in’ for rafting. Raft to Kurintar. Walk to lodge. Today you will drive east on the road towards Kathmandu, to reach the historic village of Bandipur, situated high on a ridge south of the Annapurna mountains. Once a thriving Newari town on the trade route to India, Bandipur was left stranded when the main Pokhara to Kathmandu road was built far below in the valley. The village has been carefully restored and happily a traditional lifestyle still continues here. The local people are happy to see visitors, particularly because the village has benefited so much from visitors appreciating this careful restoration. Money from tourism ventures is ploughed back into restoring temples and the traditional houses in the town. The village commands panoramic views of the Himalaya and on a clear day, you can see the whole Annapurna range, as well as peaks in Langtang to the east and Dhaulagiri in the west, from here. After time to explore Bandipur and paint, you will drive down to the valley of the Trisuli River and along the valley to the rafting put in point at Fishling, where you leave your transport to walk down to the river bank where you will meet your rafting crew. You will be given life vests and helmets and your rafting captain will give you a full briefing before you set off downstream. You will raft as far as Kurintar, a small village on the banks of the Trusili River. Here you leave the rafts and walk the short distance up to Summit River Lodge, crossing a modern pedestrian suspension bridge above waters of the Trisuli River to the village of Thuguwatar on the other side. Then an easy walk of about 30 minutes takes you through farmland and past houses to reach the lodge which is set in a spectacular location above the river with tremendous views down to the river and of terraced farmland and forested hills. Today will be a day for putting together all you have absorbed so far with lots of one to one tuition. Day 10 - Drive to Kathmandu. Rest of day at leisure. First thing today Kathmandu Susanna will give a demonstration in full colour of the famous Susanna Bailey 'colour-bar' format. Later you drive back to Kathmandu, continuing along the valley of the Trisuli River before climbing to cross a low pass into the Kathmandu valley. On arrival you will check into wonderful Dwarikas Hotel, a real haven away from the bustle of Kathmandu and a lovely place to relax, with its beautiful courtyard garden and pretty swimming pool. You will then have free time to relax or paint for the afternoon. If you fancy a little walk you could visit nearby Pashupatinath, the important Hindu temple complex set on the banks of the sacred Bagmati River just a 15 minute walk from the hotel (you may ask at the hotel desk for directions). Pashupatinath has an important Shiva temple and is the most important centre for cremations for the Hindu people of Kathmandu. It is also a real experience to go there first thing in the morning (possibly even before breakfast) when local people visit the temple with offerings. Day 11 - Walking tour to Boudhanath Stupa. Painting at Stupa. After breakfast you will have a walking tour from the hotel to visit the Buddhist stupa at Boudhanath. (If you do not wish to walk then the vehicle will be going there with the painting things so you may ride if you prefer.) Boudhanath Stupa is the largest stupa in Nepal and the holiest Tibetan Buddhist temple outside Tibet. It is the centre of Tibetan culture in Kathmandu. From the top of the stupa all-seeing eyes look out in every direction. The stupa is surrounded by streets and narrow alleys lined with colourful houses and monasteries and the whole complex is rich in Buddhist symbolism. It is an important place of pilgrimage and meditation for Tibetan Buddhists and local Nepalis, as well as being popular with tourists. Today will be for painting movement. The stupa provides a constant picture of movement as pilgrims and members off the local community circle the building in prayer. Susanna will guide everyone in a simple technique which alludes to movement and atmospherics. Day 12 - At leisure in Kathmandu. Review of paintings. Celebration dinner. Today you will be free for some last minute shopping or sightseeing or just to relax in the peaceful ambience of Dwarika's Hotel. Susanna will be there to help each group member complete their work and in the evening you will all get together to review your work and the art that has been created during you time in Nepal. You will be going home with a very precious set of memories. You will have a last celebration dinner in Dwarika's famed Krishnarpan Restaurant. Day 13 - Depart Kathmandu. Fly back to UK. After breakfast there will be a group transfer to the airport for your flight home. All painting equipment and materials (a materials list will be supplied). You will have the opportunity to purchase local paper and pigments if you wish.